In the past, aloe vera latex was used to treat constipation. However, due to concerns about dependency, it was removed from the market in 2002 (1). Aloe vera juice may also be effective as a laxative (2); however, there are additional concerns (3) to take into consideration before making blanket recommendations. As many pregnant women suffer from constipation, I think that it’s important to mention that consumption of aloe vera (juice or gel or latex) is not recommended during pregnancy as there is a risk of uterine contractions. Considering that there are numerous concerns surrounding the supplemental use of aloe vera, and many known safe and effective ways to improve regularity, the recommendation that people drink aloe juice daily to relieve constipation is baffling. Stick to the tried and true: increase fibre (through whole grains, seeds (such as ground flax and chia, legumes, fruits, and vegetables, and possibly a supplement) and water intake, try prune juice, exercise, coffee (if you are able to consume caffeine). Some medications and medical conditions may cause constipation. If this is something that you’re experiencing on a regular basis, you should check with your doctor to see if a medication can be changed or if there is an underlying condition causing your constipation. 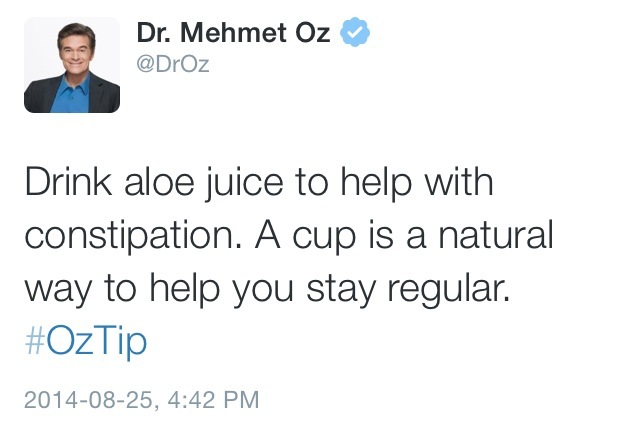 Tags: aloe, aloe vera juice, constipation, Dr Oz, misinformation, regularity, supplement safety | Permalink. I’m sure that the whole Dr-Oz-goes-to-the-senate-and-gets-scolded thing is going to be all over all of the blogs for at least the next few days. Despite this, I still feel the need to throw my voice into the fray. I’ve ranted about Dr Oz and his ridiculous supplement (and dietary) proclamations many a time (too many for me to be bothered to even give you a link right now, feel free to search my blog for my scorn). It’s not just weight loss that’s a problem. It’s pretty much every dietary and supplement recommendation that he’s made. Eat a papaya every day? Come on, are we made of money (perhaps Dr Oz should read yesterdays post)? And what happened to variety is the spice of life. Any dietitian worthy of the “RD” after their name will tell you that variety is a key component of a healthy diet. But that’s all history now, right? Dr Oz, the great and powerful Oz, has (gasp!) apologised for his role in the popularization of useless weight loss supplements. Does this really sound like the words of someone who is truly sorry: “For years I felt that because I did not sell any products that I could be enthusiastic in my coverage and I believe the research surrounding the products I cover has value.”? What I see here is Oz saying that by not putting his name on any product labels that he thought it was okay to tout each and every one of them as the next great MIRACLE weight loss cure on his show. Even more importantly, I see that Oz still believes in the “research” conducted on the products he promotes. Never mind that most of them have little to no scientific research to support their use as weight loss supplements. Never mind that those that do have research invariably have weak biased research. Never mind that he conducted his own “research” into the efficacy of green coffee bean extract using audience members. Dr.Oz, you are amazing. You get people excited about living healthier and happier lives! You show is interesting, lively and is very enjoyable as well as more importantly very informative to watch. Thank you!!! You have done far more good in your career than any other public medical professional, helping people take responsibility for their health and promoting preventive care and wellness. Don’t listen to the politicians, who are the MOST self-serving of our population and sell out every day to lobbying money. You owe no apologies. They go on and on in that vein. 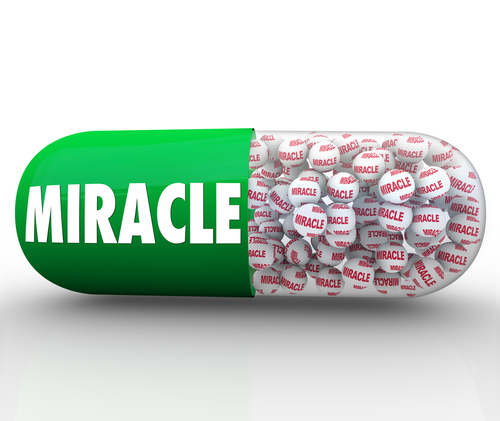 People want miracle cures. They don’t want to hear that losing weight (and keeping it off) is hard work. That’s why Dr Oz has 4.6 million likes on FB and a syndicated television show and dietitians (like yours truly) are tapping away writing unpaid blogs about nutrition in their spare time. As long as Dr Oz is being given a platform, as long as the network is getting the ratings, and as long as the public are swallowing every pill he proffers he is going to keep dishing them out. Tags: apology, diet, Dr Oz, facebook, media, nutrition, scams, supplements, weight loss | Permalink. Yeah, I know, this is old but it’s still applicable (unfortunately). Check out the excellent guide to quackery by sci-ence to avoid falling prey to nutritional and scientific nonsense. You can also follow the creator on twitter at: @sciencecomic. And have a great weekend! Tags: comics, Dr Oz, follow friday, infographics, quackery, sci-ence | Permalink. 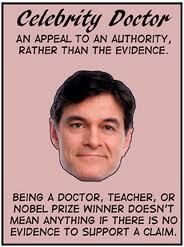 Oh Dr Oz. Where do you come-up with these gems? I can’t find any research to support this statement. Even if it’s true that banana leaf tea has a metabolism-boosting effect, it’s more than likely that the effect is negligible. Want to lose weight? Focus less on metabolism boosting gimmicks, and more on what and when you’re eating. 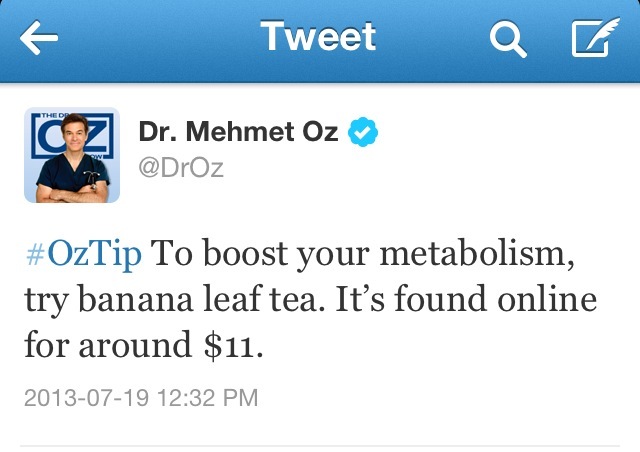 Tags: banana leaf tea, Dr Oz, metabolism, quackery | Permalink.